In terms of originality, Teeworlds scores top marks. if you combined Hello Kitty with Kirby's Dreamland and Quake III, then you'd get somewhere close to the concept. You can choose from 17 Teeworlds character designs and fight against one or more persons in the different scenarios available through LAN or the Internet. The latest release also incorporates "fair" player spawning, the ability to kick players, and a very cute welcome screen to encourage players to set their names and favorite settings before playing their first game. 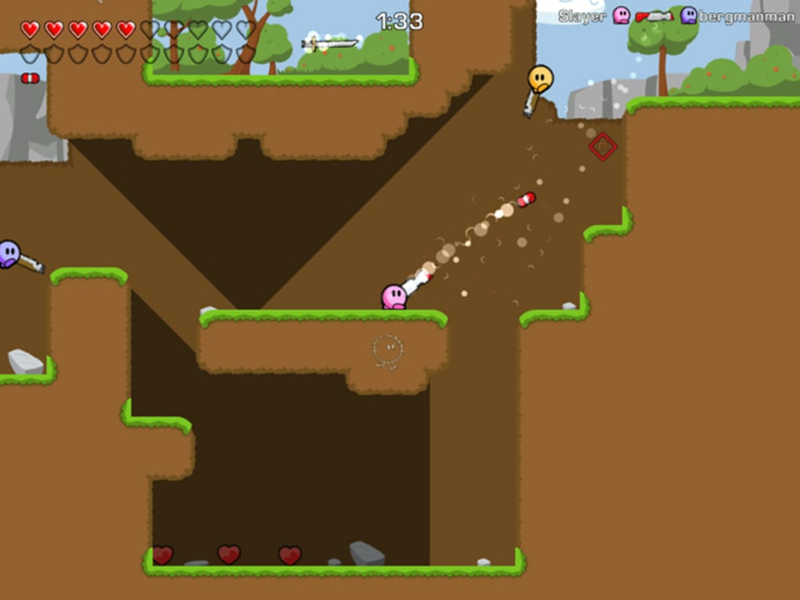 The game has quite a few similarities to the Worms series of games, with the big exception that Teeworlds is played in real-time, while Worms is turn based. Teeworlds is played using both mouse and keyboard - A/D moves your "Tee" left and right, W/spacebar makes it jump, and the mouse is used to aim and fire. 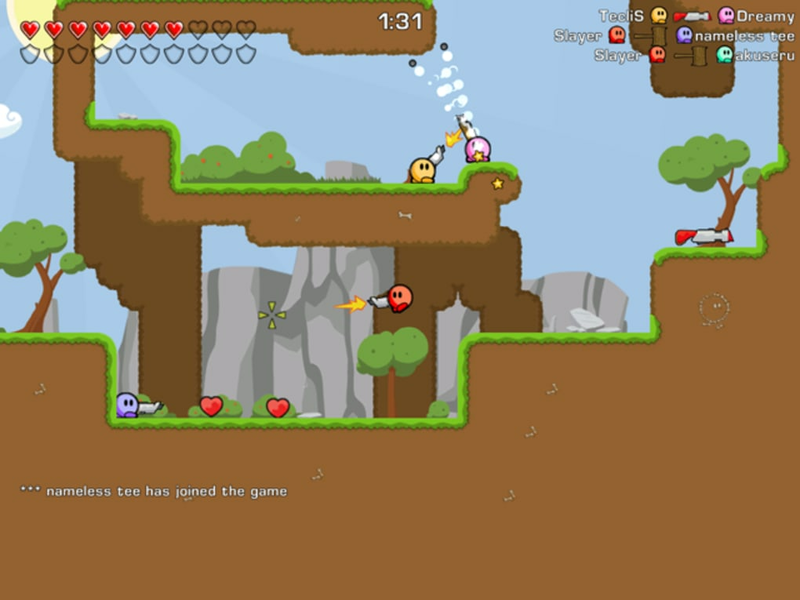 Right-clicking launches a grappling hook, which can be used to move around the map quickly, and also grab other players. Teeworlds is so far free-for-all only, but a Capture the flag mode seems to be in the works. The problem comes if you try to set up your own server to play against a friend though - it's immensely complicated but there is an FAQ to help you through. Fun, action packed and easy to play - if only Teeworlds was easier to play against others over the net, it would be even better. 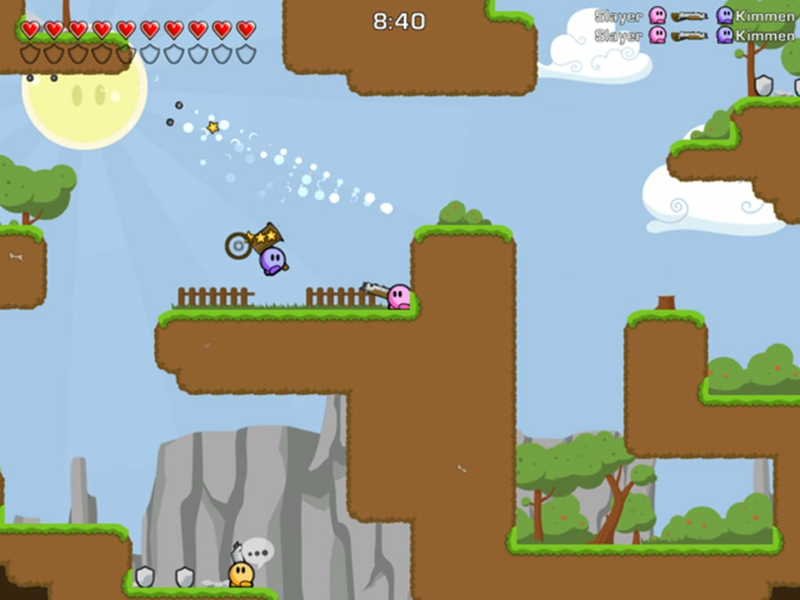 Teeworlds is a cross between Hello Kitty or Kirby's Dreamland and Quake III Arena with a touch of Unreal Tournament. This is an action game in the first person, but in 2 dimensions, in which you must eliminate all your opponents. Its aim? Kill the most enemies.